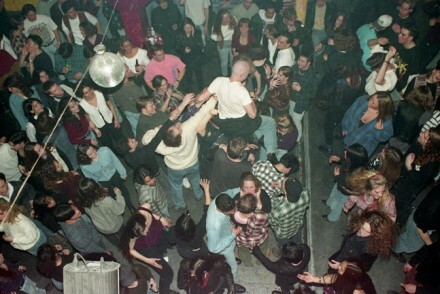 Why it was important: Industry embodied the maturation of Toronto’s late-night, underground dance-music movement. 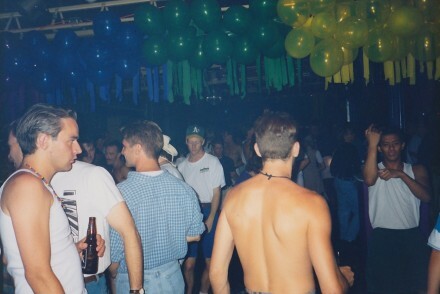 It operated during some of the most explosive years for raves in this city and proved to be an ideal home for a more seasoned, diverse, largely post-rave crowd. Above all, Industry’s programming, size and sound quality helped establish this city’s reputation abroad while also convincing Toronto to take itself—and its talent—seriously. 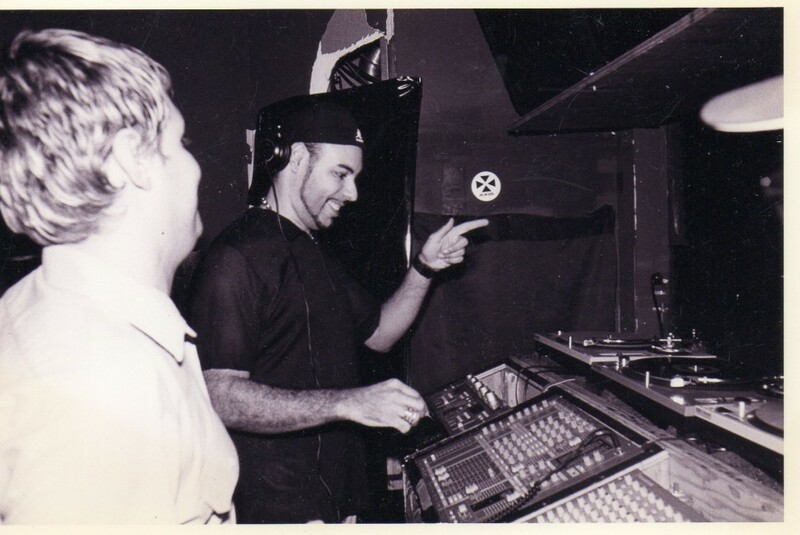 Kenny Glasgow and Mario J work four turntables, summer 1997. Photo courtesy of Gavin Bryan. To that end, Industry presented an impressive range of artists—including Daft Punk, Basement Jaxx, Paul Oakenfold, Paul Van Dyk, Cevin Fisher, Victor Calderone, Roni Size and Fatboy Slim—in their Canadian club (i.e. non-rave) debuts. 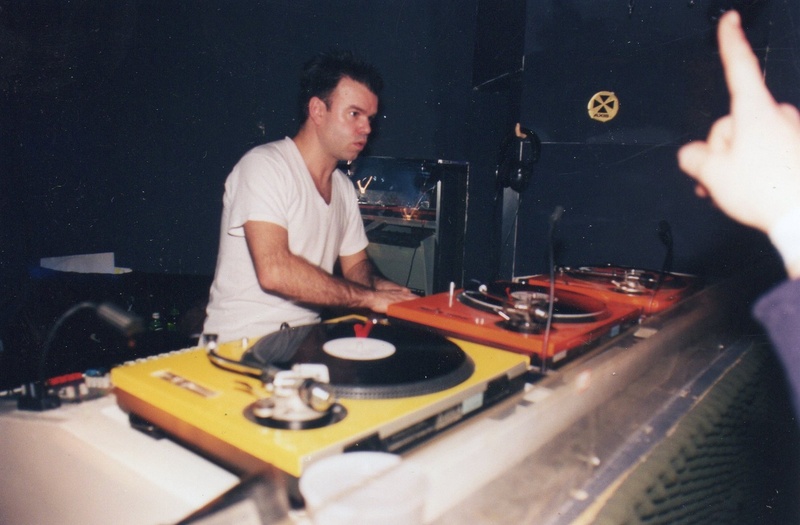 Paul Oakenfold at Industry in 1997. Photo courtesy of Gavin Bryan. Industry’s core audience was experienced clubbers, gay and straight alike, who knew their music and packed the dancefloor both before and after the club’s peak time of 4 a.m. They are the people who made it possible for Industry to expose a lot of new international talent to Toronto and vice versa. From there, the venue’s ace sound, lighting and staging allowed the DJs to play at their best. “Industry is a very special place—a DJ’s dream come true,” was how New York legend Danny Tenaglia, a frequent guest, described the venue to me in a 2000 interview. At the same time, Industry put a big emphasis on Toronto talent, with local residents regarded as stars in their own right. Peter & Tyrone on four decks. Photo courtesy of Gavin Bryan. 4:am CD artwork courtesy of Matt C.
Like all significant dance clubs whose influence is felt long after their doors have closed, Industry was its own scene, thanks to the music, the audience and a deeply involved staff that included some of Toronto’s dance club scene-builders, like Steve Ireson, Jennstar, James Applegath, Rommel, Jason Ford, Mychol Holtzman, Ronnie Ferszt, Craig Pedigrew, Ludikris, Luke Fair and a young Christian Newhook (now known as Dinamo Azari of Azari & III). Industry staff Jennstar and Yasna. Photo courtesy of Gavin Bryan. 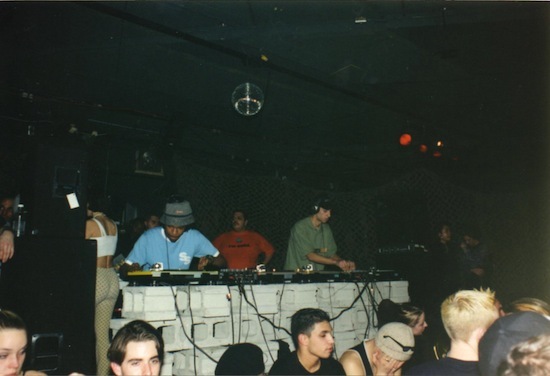 Who else played there: Industry was anchored by residencies including Friday’s hip-hop night—which ran from 1996-99 with core DJs including Baba Khan, Sean Sax and Starting From Scratch—and SLAM Saturdays, a house and techno night open until 8 a.m., helmed by locals with international guests. The Syrous crew promoted a monthly drum ‘n’ bass night Thursday, at which some of the globe’s greats played, while the monthly Fukhouse nights gathered techno giants including Richie Hawtin, Stacey Pullen, Derrick May and Jeff Mills, who infamously made it to play during Toronto’s infamous blizzard of 1999 (yes, the year Mel Lastman called in the army). Also greatly loved were DJ Sneak’s Solid Sundays, which brought lovers of funky, Chicago-style house together on long weekends. Sneak, in fact, became an ambassador for Industry and re-located to Toronto partly because of the club. Derrick Carter with Gavin Bryan and J-Dub, 1998. Photo by Idalina Leandro, courtesy of Gavin Bryan. 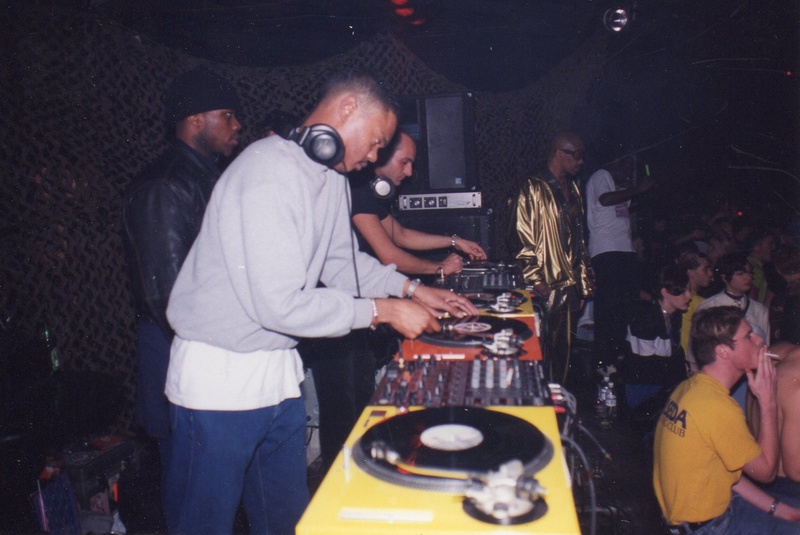 Other key names to mention: Derrick Carter (who played at Industry a record 17 times), John Acquaviva, David Morales, Goldie, Josh Wink, DJ Heather, Honey Dijon, Frankie Knuckles, Wyclef Jean and the list of notables goes on. 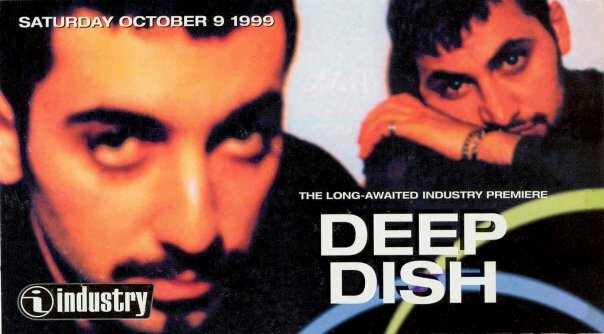 Flyer promoting Deep Dish at Industry, October 1999. 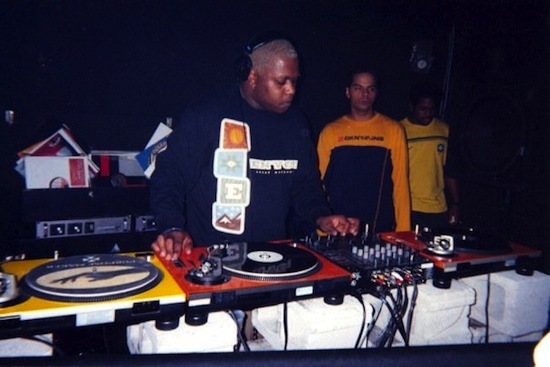 Flyer promoting Carl Cox at Industry, July 2000. Gavin Bryan makes mention of an event that many, myself included, still rave about. Crowd loving Danny Tenaglia at Industry. Photo courtesy of Gavin Bryan. What happened to it: While financial stresses caused by dwindling profits played into the foursome’s collective decision to close Industry’s doors, the forces of Toronto city development weighed heavy. 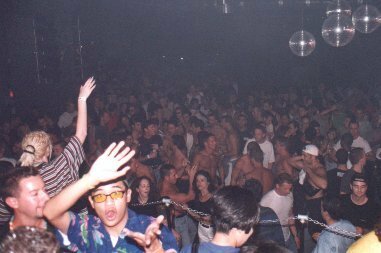 Industry went out Sunday, Aug. 6, 2000 with a 20-hour party that featured Matt C, Mr.C and Danny Tenaglia. 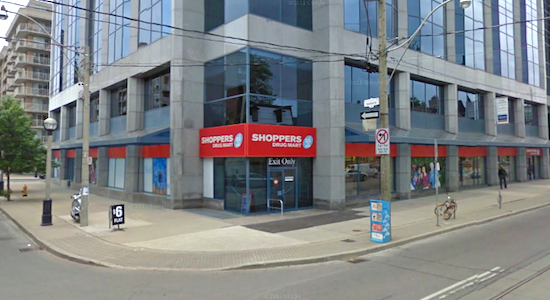 A Shoppers Drug Mart now stands in its place, with the cashiers stationed where Industry’s DJ booth once was. Shoppers’ cashiers are now stationed where Industry’s DJ booth once was. Bryan continues to produce and market events as Gerbz; Bellavance founded Prism, a series of large-scale gay men’s circuit events; Matt C continues to DJ occasionally, but is a successful realtor working with former Industry manager Ben Ferguson; Mario J. went on to promote under the A.D/D. banner, but is now producing music as Milano, with a new EP set to drop on Tiga’s Turbo label on December 13. As a promoter of Industry working with Gary Costa and the steet team in those day taught me how to communicate with people in a positive upbeat manner, nobody could stop us as a promo team because we believed in what we were doing and repersenting , we were proud about the club. 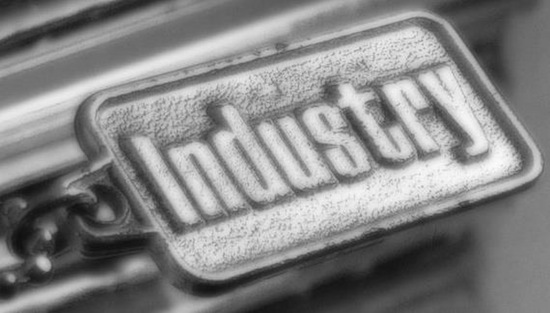 I have fond memories of Industry. Check out my instagram account, which has many old flyers from this legendary club. Over the years, I’ve been fortunate enough to party at some amazing clubs around the world, but Industry will always hold a special place for me. As a young(ish) kid whose entire experience with dance/DJ culture to that point had been forged at raves, it represented my first time seeing something done really professionally. No lining up outside of a dodgy warehouse, or having to call the day of in order to find out where the venue was, no more having headliners not show up, or having the police threaten to shut it down – it represented a whole new world to me. A very good friend of mine lived directly across the street from it during his final year at U of T, and none of us could figure out why he chose to live so far from campus in a part of the city where absolutely nothing was going on at the time (cheap rent was the answer). We still chuckle over that piece of good fortune. It was an amazing place where I discovered so many new sounds and artists, and it’s where Toronto’s dance scene first grew up. It still blows my mind to think that Luke Fair got his start there as a busboy. I think it’s telling that even now, 13 years after it closed, people still get excited when they talk about it. Without a doubt, it stands right up there with the top clubs in any city on earth, past and present. It existed during a great period in this city’s history, and there were other great clubs around at the same time, or slightly after (System Soundbar, Roxy Blue…), but Industry was, and forever will be, the king of them all. I sure have fond foggy memories of this place. 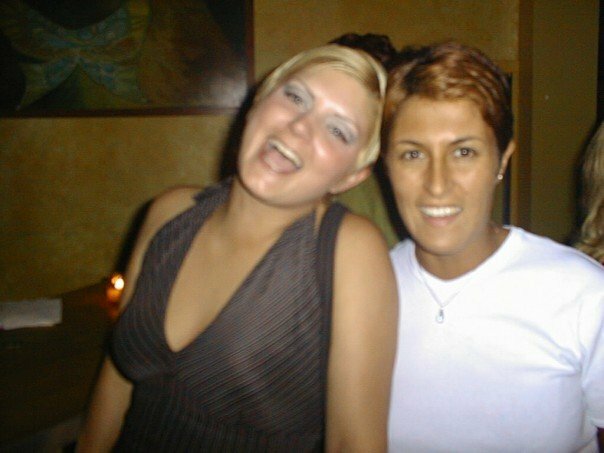 Does anyone remember what night was the gay night at Industry around Dec 15th 1999. My partner and I believe we met Dec 15th but that was a wed night. frankie knukles if memory serves me. man i cant even oput into words had much fun this place was. i think about every now and again, i have to admit i sometime shed a tear or 2. I was fortunate enough to hit Industry a few times before it closed up. The nights that stand out in my mind were the Destiny Ascension parties that were the last Friday of the month for the longest time. I remember being one of the last ones on the dancefloor with about thirty or fourty others at 7am, rockin it to Madagascar. Loved that place. Except for that one step that just appeared out of nowhere and tripped me up a dozen or so times….hahaha! I was there that night! And many other memorable ones. Thanks for the loving tribute. Industry was the club that helped open my eyes to what was possible in terms of promotion and booking talent and building a community around the incredible atmosphere you can only get when people who genuinely love music gather together in one place. It certainly had a massive influence on me when I started Breathe. Even though I was never close on a personal level with Matt, Gavin, Kenny and the rest, I will always have a warm spot for them in my heart. May that early morning, mid-dancefloor spirit live forever. I had the honor of watching Daft Punk play a set from 4 feet away @ Industry. That would never happen today. Also watching Mat Herbert play a live p.a using only a looper, kitchen utensils and a light! I miss it all. Thank you for this Denise. I am happy to say that the old home of Industry is my neighborhood shoppers drug mart. I have some footage, it’s on VHS but I have it. I’ll try to post in the next week or so. Thanks for paying homage to what really was something special. I had the pleasure of spending a few magic all-nighters at Industry, dancing the night away as condensation dripped off the walls, then emerging exhausted but smiling after dawn, blinking into the morning sun. Caught some great dj’s there, like Danny Tenaglia, Fatboy Slim, and Basement Jaxx. A special place at a special time in the history of electronic music. Other times in summer on an early Sunday morning bike ride I’d cruise by the building and hear the beats pumping out of the vents at the back of the building as the party raved into the morning. Good times all around! Then & Now: 52 inc.